• Advanced AutoCal™ automatic internal calibration ensures accurate weighing. The OHAUS Discovery series features four analytical models with capacities up to 310g by 0.1mg with a FineRange™ model that offers 10 microgram readability. 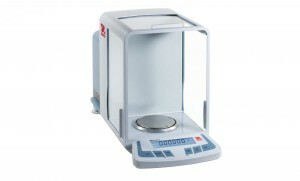 Discovery is perfect for university research, pharmaceutical research and drug discovery, and general lab applications. Discovery’s repeatability and linearity performance is 2x better than most semi-micro balances in its class. Glass and steel construction resists the effects of static and corrosion increasing balance stability and accuracy, as well as extending product life. Delivered through a 2-line backlit LCD and clearly marked buttons, SmarText™ tells you what is going on and what you have to do next. Function button, SmarText™ will display application reference information such as the average piece weight (APW). To minimize weighing errors and ensure accurate measurements, AutoCal™ utilizes two internal weights to perform a linear calibration. AutoCal™ internal calibration system automatically calibrates the balance when it senses a temperature change significant enough to affect the weighing accuracy.